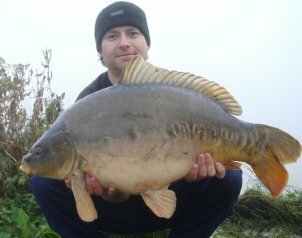 Many carp anglers have a habit of turning up at a place that they think looks the best or one where a few friends have caught carp before. However, carp will always feed in places where they feel safe, and if anglers are catching carp regularly from a certain place, then the carp will eventually associate the area with danger rendering that hotspot useless. Many carp fishermen often believe that if they’re not catching it’s probably due to the wrong type of rig, but even if you’re using the best rig in the world (which is impossible because there’s no such thing!) you cannot possibly catch carp if there aren't any around the swim! So, if you want to catch more carp on any water, then you must locate the carp before choosing a peg. This is not an easy task, especially if there is a cross wind blowing on the lake. But there are basic things to look out for before fishing for carp. As you arrive at the lake, spend some time just watching the water looking for signs of carp movement or carp feeding. Try to look for fish rolling or crashing in the distance. You may need to bring some binoculars for this task. Look for feeding bubbles close in the margins as you walk round the lake, if the bubbles are not static and slowly travel across the water, then it’s more than likely to be fish. Look for large swirls or movements on the surface of the lake. Okay it may not be carp, but surely it’s better to catch a tench or bream than nothing! Watch for carp jumping out of the surface of the water, especially around the middle of the lake or areas where nobody tends to fish. If you can’t see any of these signs within an hour or two, then you can try other ways of locating carp. A good tip is to choose an area where there are no fishermen at all. In other words, if three-quarters of the lake is taken then choose a peg somewhere in the other quarter. If you see one of the best pegs empty, but there are carp anglers all around it then stay away as the pressure of the surrounding anglers can drive carp out of the area. Even if some are catching carp it may be just the odd few fish swimming through their patrol routes. If you turn up on a lake at the weekend and most of the pegs are taken, then go where you have to, and if possible, cast into the middle as far from other lines as possible. The lines all around the new lake may force carp into the middle area of the lake. Remember the carp can hear all those leads splashing in the water even from a distance, and if the lake is pressured the constant splashes may just push most carp into the furthest regions of the lake. Think about the weather conditions, not just on the fishing day, but also how has the weather been over the previous days. Has the temperatures or air pressure been affected in some way? If it’s been hot, the shallow waters will be warm, and carp will head toward those warmer regions, especially in the cold mornings when the sunshine hits the shallow water. Let’s discuss each of the above in more detail. Islands are a common area where carp tend to patrol, because they offer some protection and cover - providing there are overhanging trees which protrude over the water. The carp may feed freely around an island providing carp anglers do not target these areas too often as the pressure can force carp to seek other quiet areas. Fishing an island on a new venue can be a safe bet, especially on a quiet day, plus an island can make a great marker for accurate casting without having to use a marker float which may spook the carp if used too much. Casting towards weed beds can be a nightmare for many anglers. There can be many problems with hook bait presentation, and if a carp is eventually hooked, you’ll need to stop it from diving into the thick parts of the weed. The good news is carp love weed beds. It makes them feel safe and tends to contain lots of natural food. So if you are struggling to locate carp using sight alone then fishing close to a weed bed can produce plenty of carp. These are similar to the weed beds in that they provide shelter and food for the carp, thus they are a great place to place a hook bait, especially for floating bait in-between individual pads. The only downside to fishing the lilies is they are often situated near the bank so you may need to be quiet when setting up. Again these are a good place to see carp patrolling, however like lilly pads, they are often situated close to a bank so the carp may not feel as safe. This may effect how confidently they feed. I believe overhanging trees are one of the best places to head for when fishing on a new, unknown venue. They provide carp with plenty of security and shelter, and I have personally witnessed carp feeding very confidently. I have also seen some of the biggest carp caught from under a tree. The reason I believe they are so good is because many anglers neglect them. I see many carp anglers cast far out ﻿towards the horizon﻿ without giving a thought to the trees or fishing in the margins. Many trees also grow berries which are a natural food for the fish so they may associate overhanging trees as a natural area for feeding. Snaggy areas can be some of the best places to find carp. Carp often associate these areas as safe because many anglers won’t risk fishing in snags. However, if you’re prepared to take some risks, you may be able to find a spot just away from the snags where (if you fish with tight lines and stand close to your rods) you may be able to drag the carp away before they have chance to head for the safety of a snag. The direction of the wind is a common reason why many carp anglers end up in their chosen peg. The common belief is that carp follow the wind. I agree, although I’m not sure why. Maybe it’s because it helps push food towards the windward bank, or maybe it helps stir up food at the far bank. I have also read that the wind can help push the thermocline down deeper. The carp tend to follow and swim in this comfortable, warmer water and thus end up closer to the bottom where rigs are placed. Whatever the reason, I do not believe it’s always necessary to fish the far bank (windward bank) where the wind is heading. Sometimes it's best to fish off the back of a cold wind, especially at times of the year when the oxygen levels in the water are high. The shallow waters may not sound like a potential hotspot, but if you turn up to a new venue on a cold morning and the sun is beaming down into the shallow end of the lake, there's a high possibility that carp will be located around that area. Shallow waters warm up much faster in the morning sun, and carp will always seek out warm spots. For a more in-depth look at watercraft you need to read Carp Fishing Secrets. This is clickbank's top selling carp fishing book. Having been written by some of the county's leading carp anglers, it will answer many carp angling questions. It covers a huge list of topics within 270 pages, all to help you bank more carp. It can be downloaded immediately! How Deep of Water Do Carp Prefer to Patrol in? How Many Times Should I be casting out Rigs?